In the United States, people with disabilities have more access to services and products for daily living and other purposes however people with disabilities in other parts of the world often times don’t even have access to wheelchairs. World Access Project is a nonprofit that realizes this problem and has found a way to help. The World Access Project provides custom-fit wheelchairs and other mobility aids to people living with disabilities in rural Mexico. Richard St. Denis is the founder of World Access Project. The WA Project donates used and new wheelchairs to people with disabilities living in Mexico. The organization also offers sports clinics and events to keep people active. St. Denis is a veteran of the U.S. Air Force. He credits sports with improving his life after a spinal-cord injury that left him paralyzed from the waist down. St. Denis has found that playing wheelchair sports can boost one’s self-esteem. Also, he was once a world-ranked athlete in wheelchair skiing. Due to the increase cost of oil, transportation expenses, refurbishing and other costs (over $200/ wheelchair), the WA Project has come-up with another way of continuing their work. In 2011, to reduce some of the cost and problems from border crossing, they are working with a company in Mexico that makes quality, durable, dependable every-day wheelchairs, designed to be used in the rough terrain. The company also makes crutches, walkers and canes for a very reasonable price. 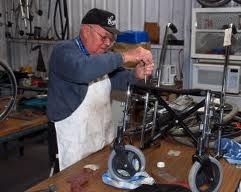 Presently, the WA Project is purchasing the majority of their mobility equipment in Mexico. The organization also hosts three major sports camps in Mexico each year. The first camp is located where they are based (northwest corner of the state of Mexico). The second camp is located in Mazatlan area (west coast); and the third camp is in Puerto Vallarta (south of Mazatlan). In addition, they host one-day sports exhibitions and recreational camps throughout the year in various locations throughout Mexico. During the camps, participants have the opportunity to meet others who use wheelchairs. They share their experiences, feelings and concerns. They make new friends, share their lives, help each other, and develop a support system. The World Access Project is always looking for volunteers. They invite volunteers from the United States and Mexico to join them — individuals, teams, churches, schools, clubs, etc.